With this little number, you'll be prayin' for some bad weather. Huk's Next Level Jacket is built to keep Mother Nature at bay. For starters, we have a lightweight stretch 3-layer, Waterproof 10,000mm / Breathable 5000g shell. This pretty much keeps all of the moisture out while maintaining superb breath-ability. With this little number, you&apos;ll be prayin&apos; for some bad weather. Huk&apos;s Next Level Jacket is built to keep Mother Nature at bay. For starters, we have a lightweight stretch 3-layer, Waterproof 10,000mm / Breathable 5000g shell. This pretty much keeps all of the moisture out while maintaining superb breath-ability. Taped seams of course, waterproof zippers from the front zip, pockets and heat dumping pit zips. 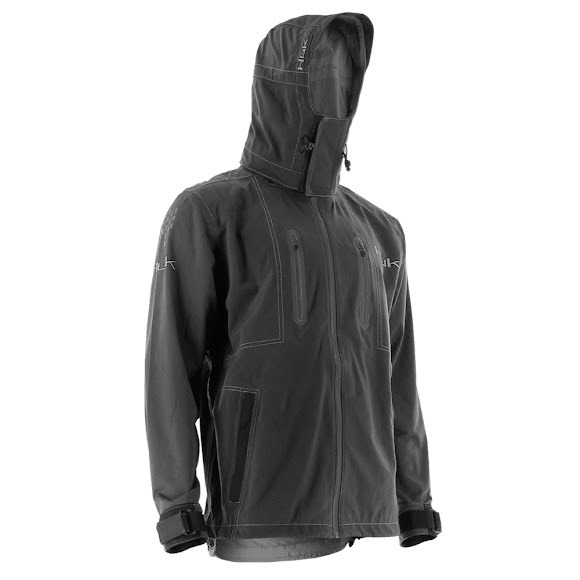 A removable 3 piece articulated hood, with a shaped bill and draw cords at the front and rear to dial in the fit. The cuffs have a hinged lock down closure to keep the water out and the collar uses a venting system to keep your optics from fogging. The final touch for safety is to add reflectivity at the shoulders, chest pockets and logos. That downpour is starting to feel more like a mist.